Basically heres what still needs to happen. Soil temperatures need to be higher still since 35 is optimal for feeding but right now the heater isn't getting things higher and we would eventually like to take the heater out since it dries out the soil very rapidly, humidity is a major concern. We dont want to keep adding as much water in the future and have tried placing a water basin underneath the heater in the center of the bin but so far not much progress has been made. plans to seal the plastic covers around the bin more will definitely help but i was also looking to you guys for suggestions on this. And lastly we wish to have a successful pupating/breeding/egg laying container to keep a steady supply of eggs going into the bin, replacing what is harvested. I know that most people insulate their bins by placing foam directly over the colony but that is for an already established, active colony. Ours is sluggish and we have a space heater on them or else they will be totally inactive. i know what active grubs look like and these are not there yet. I will post pictures in a short while. Please give me suggestions, advice, criticisms, insults...whatever. Sorry for such a long post, I am really passionate about making this work and so is everybody else i work with but as of late im starting to feel a little foolish taking on such a project at this time. 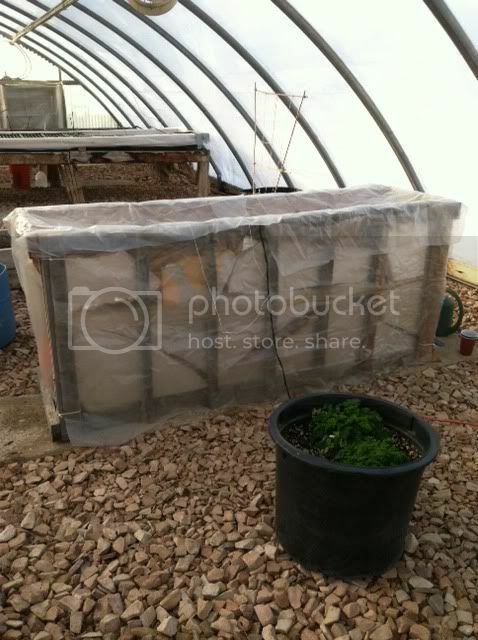 Welcome to our forum biobehaviorist Looking forward to seeing photos of your setup. For heating I know some people use aquarium heaters to heat worm bins in winter which might do the trick for you and not dry out things. The aquarium heater is usually put in a gallon jug of water which is placed inside the bin under the surface of the material. Could you clarify what you mean by 'soil'? Usually there's nothing in the bin but larvae, their castings and the feed material which is what I think you mean. Jerry, the creator of this forum and the blog, coined the term 'pudding' for this mixture which describes it's consistency well. Are you going to let the adult flies have the run of the green house or have some sort of breeding cage? The bottom layer of the bin was filled in with dirt and spent potting soil to keep the grubs from escaping through the bottom, so when I say soil I am referring to the material inside the bin which is quite literally soil in this case. and here are the pictures i promised earlier. The exterior has random bits of foam insulation wedged between the plywood walls and the shipping crate, and then a layer of plastic sheeting over that. 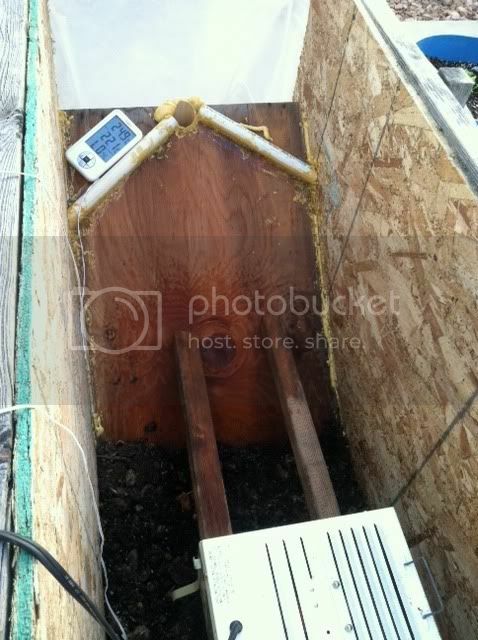 one of the ramps and the thermometer in the corner measures humidity, air temp inside the container, and a probe buried about 6 inches below the surface of the compost measures a second temp recording. The space heater is resting on two parallel pieces of wood wedged between the ramps and sits about 3 inches above a water basin to supplement humidity, but this has not been effective yet and mostly acts as a heat sink/ and absorbs the direct heat from drying the compost too quickly. Looks interesting. How many larvae did you start with and how deep is the compost over the soil at the bottom of the bin? We started with 5,000 grubs. I would say the soil is about 1ft deep it is basically all that is in there. 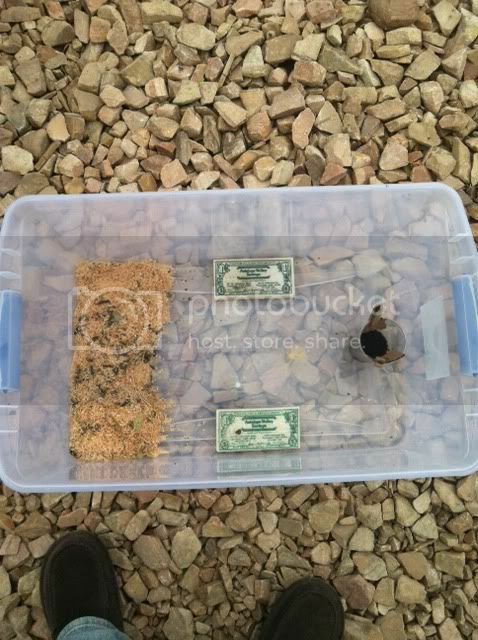 the top layer is not very much the grubs have been in for about a month and then the food that they have been given. Grubs seem mostly inactive still. Food that gets added to the top dries out and is ignored by the grubs who are still just clumped together in bunches, buried below the surface. I can get them to feed if I bury things they will feed on and put it directly on top of the clusters of grubs. Also i noticed we now have some mycelium or some other white fungus/mold growing around too...is this a concern? First off I have zero experience with larger scale BSFL bins. My experiments have been limited to a couple of hundred larvae so take my suggestions bearing that in mind. Hopefully Tarvus or someone else with direct experience will comment too. If your larvae are clumped together in bunches and not eating it suggests that they are doing the BSFL equivalent of hibernating due to low temperatures or some other environmental clue (lighting?). You might not need such a large space for a few thousand larvae so possibly switching to a smaller bin which will be easier to keep warm is an idea. Something like Jerry's BSF bucket composter v2.1 (link) could be hung high up in your existing bin where it should be warmer. If you do go this route transfer only the larvae and feed stock and not the soil. Thanks for the suggestions BW here is my gameplan for this week. 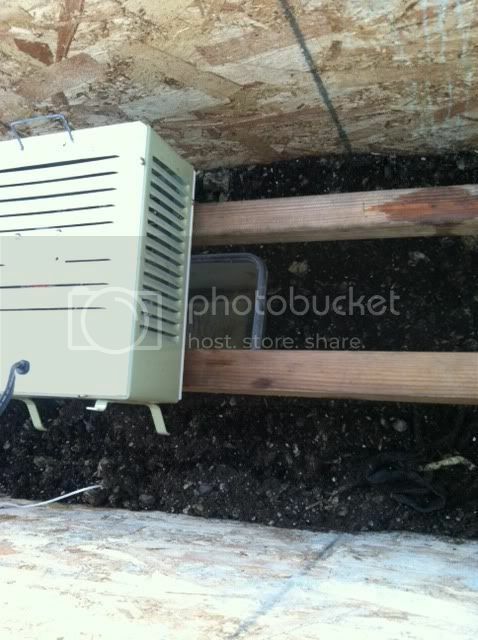 First i will be adding a small bucket filled with water to the bin with an aquarium heater and an airstone for humidity and heat, and remove the space heater. I will see if this makes an impact in the right direction and in a few days if nothing has gotten any better, i will be digging out as many grubs as i can and putting them in a 5 gallon bucket that will be set up inside the bin to try and condense the population to a smaller area. hopefully this will spur them into activity and i will be getting some crawl off that i can use for breeding. another update. I dug out and sifted as many grubs as i could from the soil. This took me the better part of 2 days, one handfull of dirt at a time and i think i have about 1 to 2 thousand grubs now that are still alive and put them all in a 5 gal bucket pod. This bucket along with the water filled bucket with an airstone and aquarium heater for humidity and a space heater for heat are all now housed inside the bug barracks. I hope that the increased density will spur the grubs into action. My theory is that they spaced themselves out in the soil and then got cold and went into hibernate mode inside the bug barracks. now they are more condensed and warm and humid so hopefully there is no more "x" factor that I am not thinking of. we will see what happens after a few more days but they appear to be more active and feeding so maybe this is what they needed. If this works out by the time it warms up in spring you can expand into the full 'barracks' with the next generation. I worry about humidity in my setup too and try to keep it as high as possible. Do you know what the humidity level is inside your bin? After we added the small bucket full of water with an airstone and aquarium heater the humidity read at 40% and rose overnight to 70-80%. By the 2nd day it was reading "HI" and then too much condensation built up inside, making the thermometer unreadable. As for expanding into the barracks by spring, that is the plan, but now I need to set up the breeding tote. I have a lot of end stage grubs that are in the bucket as well as some that are still feeding so I know they are ready. Im also wondering if adults could just emerge from the bucket and lay eggs back into the compost instinctively or would they just escape the barracks. Im going to set up a tote just to be safe with sawdust for the emerging adults and coffee ground egg traps for egg laying females. ... Im also wondering if adults could just emerge from the bucket and lay eggs back into the compost instinctively or would they just escape the barracks. I'm sure some would emerge but in nature the larvae are seeking a dry spot away from the feeding area to pupate. I think you'll get better results with the tote and sawdust or wood shavings. Im going to set up a tote just to be safe with sawdust for the emerging adults and coffee ground egg traps for egg laying females. To maximize your chances I'd also use cardboard strips and other attractants. See the posts by PeterB (link) for ideas. I wouldn't discard any that you think are dead. Shift all of the motionless larvae/pupa over to your pupation container. If you get a chance photos of your bucket and pupation/breeding tote would be appreciated. The "dead" ones will stay in the bucket...just going to pull out the dark ones and get them set up in the sawdust for the breeder but I think there is clear distinction between dead grubs and inactive grubs, dead ones tend to be wrinkled, shrivled and squishy/soft. the inactive ones are still plump and full, just not moving. a light squeeze feels some resistance, the grubs body doesn't "cave in". Pictures to go up this afternoon. I'll have to admit I've never 'squeezed' a larvae. Motionless larvae may be pupating (link1), (link2). Leaving them in the bucket is a good compromise I guess - they may still pupate if they're still viable or they'll be larvae food if they're really dead. here is how the set up has looked for the last week or so, with the grubs in the orange bucket, the space heater and the water bucket with airstones and an aquarium heater for humidity. 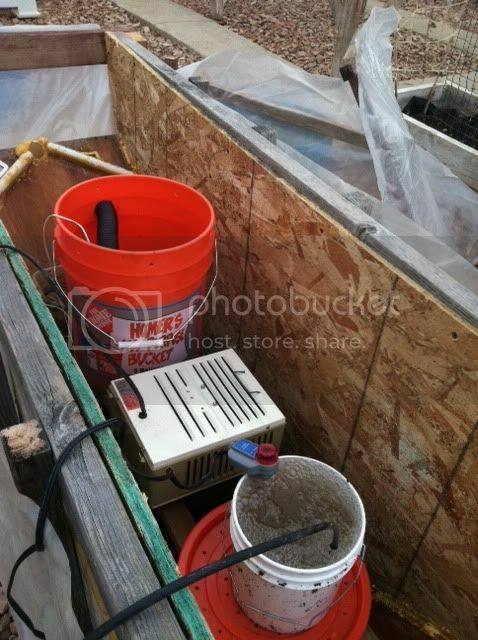 overall it worked pretty well but the space heater kept things a little too dry even after the bucket was added. when the space heater was removed things got really humid. We had one crawl off after a week and I think that's because the ramp was not very effective. most of the prepupae went to the edges of the bucket and buried themselves in the gravel at the bottom. This is the breeder tote, on the left is the sawdust with about 100-200 dark grubs that will hopefully emerge as adults in the following weeks. Sponges in the middle soaked with water for moisture and a cup with used coffee grounds and cardboard egg traps fastened to the sides with clothes pins. I think that is all the essentials for breeding correct me if I'm wrong. This tote is now inside the larger bin along with the grub bucket, space heater and humidity bucket (getting a little crowded in there ). I know light is a concern, but I'm hoping there's enough sunlight coming in through the greenhouse but the bin is only getting light from above. I wrote this only to make you confident in your work. During the last year I could even write a book of how much experiences I have done. I´m getting close to what I want. At this moment my focus is to improve the productivity of my system. Unfortunately we are working in diferent conditions so I don´t think my solutions will work in your system!